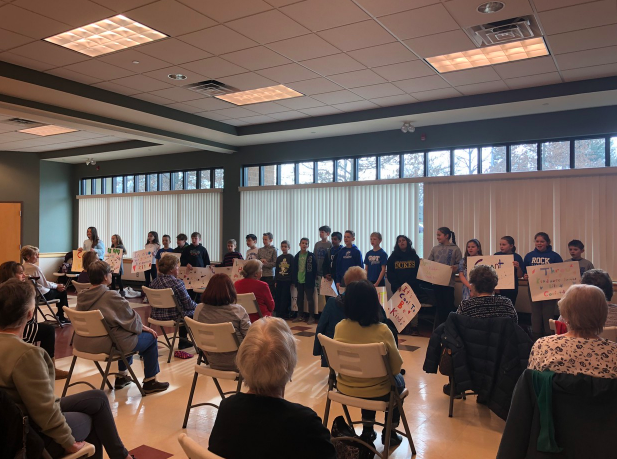 Richboro Elementary School Principal, Dr. Daneyelle Jordan, RES 5th grade teacher, Deb Cicchiello, RES music teacher, Kitty O’Connor, and twenty‐one 5th grade stu­dents had cocoa and cook­ies with local senior cit­i­zens at the Northampton Senior Center recent­ly. The inter­gen­er­a­tional activ­i­ty proved to be a tru­ly “sweet” way to wel­come in the New Year, as stu­dents sang Hakuna Matata and Count on Me before enjoy­ing warm win­ter treats and qual­i­ty time with their neigh­bor­ing seniors. ← Previous Previous post: Council Rock South High School’s Zero Robotics Team to Compete at M.I.T.